The ground squirrel is the most common species of squirrel in Southern California. Ground squirrels are relatively small rodents. The largest ground squirrels weighing in at about 2 ½ pounds. Ground squirrels thrive in rural and agricultural environments, where they burrow, creating burrow systems on your property, under storage sheds, barns and buildings where they find food and water. In Southern California, we have done squirrel control to remove ground squirrels from dirt roads, office buildings and yards. How Do I Know I Have a Ground Squirrel Problem? Digging from ground squirrels damages residential, public and commercial properties. We have been called in to perform ground squirrel pest control around paved and gravel roads and outdoor restroom and recreation areas. When ground squirrels burrow in sloped terrain, the damage can be extensive, contributing to erosion that can lead to landslides and mudslides. Ground squirrels can ruin vegetable gardens, landscaped areas and fruit and nut trees in their quest for food sources. Ground squirrel pest control is important for the aesthetics of your property and for maintaining the health of trees and plants, but it is also necessary because ground squirrel control can protect the health of you, your family and visitors to your property. Ground squirrels host many types of parasites. In addition to fleas, ground squirrels can carry parasites that harbor spotted fever, Colorado tick fever, tularemia and other life threatening conditions. Knockout Pest Control technicians use bait and removal methods to remove ground squirrel infestations. 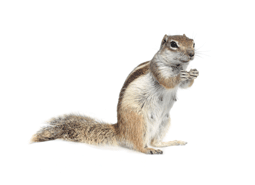 We offer monthly, bi-monthly and quarterly squirrel pest control services to keep your property safe from ground squirrel infestations and their impact.